The skin, the body’s largest organ, has some interesting facts. According to the American Academy of Dermatology, the body makes new skin cells all the time and gets rid of old ones. In fact, the body gets rid of 30,000 to 40,000 old skin cells on an hourly basis, which averages at a whopping one million dead skin cells a day. Why is it Necessary to Remove Dead Skin? Your skin, which acts as a protective barrier between your body and the undesirable elements in the environment, is composed of two distinct layers: the outermost layer called the epidermis and the layer just underneath it called the dermis. Healthy skin cells, or keratinocytes, are formed at the base of the epidermis and gradually move up through the skin to reach the outer surface. These cells are made up of a fibrous, waterproof protein called keratin. As they make their way from the base of the epidermis to the exterior surface, these once healthy cells lose all their cellular mechanisms and become a dead scale-like structure that’s filled with keratin. It takes anywhere from a couple of weeks to a month for a skin cell to complete its life cycle and reach the skin’s outermost layer called the stratum corneum. The stratum corneum is composed of nearly 15-20 layers of dead skin cells that travel up through the skin layers over time and are eventually shed through a process called desquamation. As many as 40,000 skin cells are shed every hour, and it takes one skin cell just about a month to complete the entire process of desquamation. As the dead cells at the surface of the stratum corneum are gradually shed, fresh cells make their way to surface in order to replace them. Thus, this natural turnover of skin cells results in complete skin rejuvenation every month. The top 18-23 layers of the skin consist of dead skin cells. The continuous process of sloughing off dead cells gives way to new living cells that move up from the lower layers. This continual renewal keeps the skin looking young, smooth, and radiant. With age, this natural skin cycle slows down, which can result in an accumulation of dead skin cells on the outer skin layer. This buildup makes your skin appear dull and dark and leads to blemishes and more fine lines. Just taking a bath or shower is not enough to clear away the layers of dead skin cells. Weekly exfoliation is one of the best ways to get rid of the dead cells and keep your skin soft and smooth. Exfoliation also helps moisturizing products to penetrate deeply into the skin and improves blood circulation. Exfoliation is necessary for all the skin types, whether oily, sensitive, or dry. 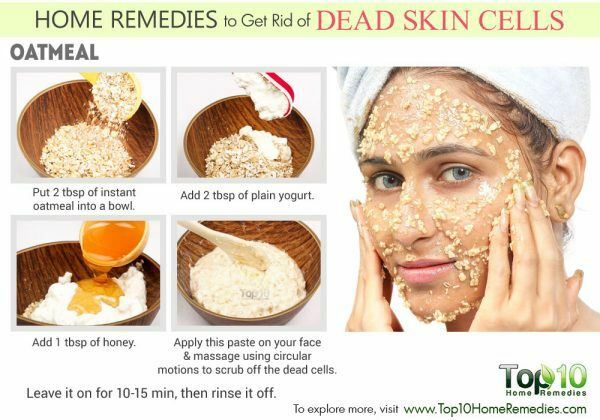 This process helps to remove dead skin cells from the outer layer of your skin. It should be done on the face and on the elbows, knees, feet, and other areas that tend to become dull and dark. However, it is important to exfoliate your skin in the right manner or else it could cause more harm than good. Also, it is very important to know your skin type first before choosing an exfoliation method. Although there are chemical products that exfoliate the skin, such as glycolic acid and salicylic acid, there are many natural ingredients in your kitchen that can help remove dead skin cells and give way to fresh and clear skin. Here are the home remedies to get rid of dead skin cells. The grainy texture of oatmeal works as a great natural exfoliating agent for all skin types. The saponins in it help remove dead skin cells, excess sebum, and other impurities. Plus, the vitamins and minerals in oatmeal are good for your skin, and the protein in it prevents water loss to keep your skin moisturized for longer. In fact, oatmeal, especially colloidal oatmeal, is extensively used in personal care products. It has been found safe and effective for cosmetic use. Put 2 tablespoons of instant oatmeal into a bowl. Add 2 tablespoons of plain yogurt and 1 tablespoon of honey. Mix these ingredients well to make a paste. Apply this paste on your face and massage using circular motions to scrub off the dead cells. Let is sit on your skin for 10 to 15 minutes, and then rinse it off with cool water. 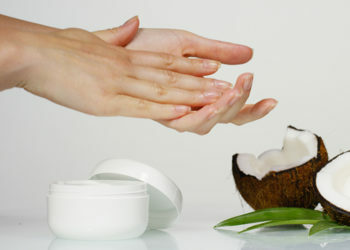 Pat your skin dry and apply a light moisturizer. Another option is to mix 2 tablespoons of oatmeal, 2 to 3 teaspoons of honey, 2 teaspoons of lemon juice, and a little water to make a paste. 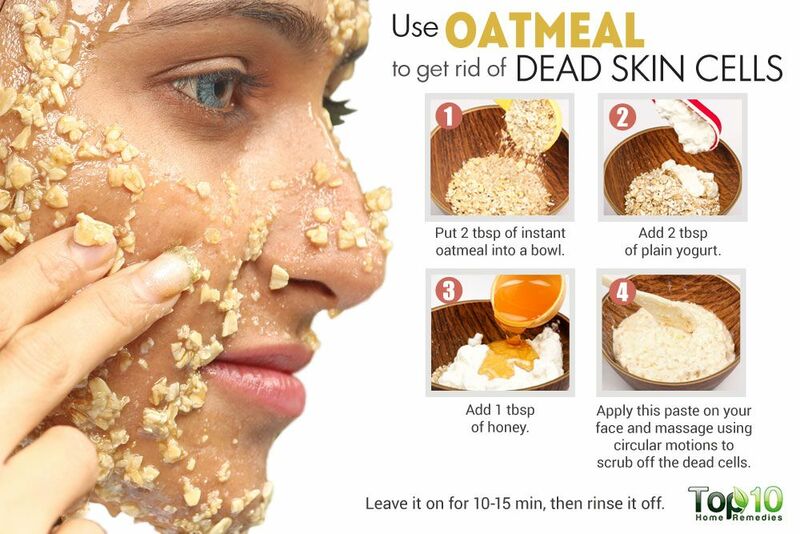 Gently rub this oatmeal scrub on your skin for a few minutes. Leave it on for another 10 minutes, and then rinse it off. Repeat either of these remedies no more than once or twice a week. 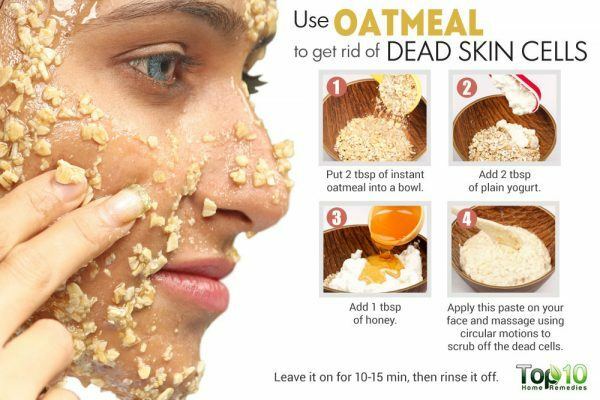 You can use these oatmeal scrubs on your face as well as on your body. The combination of sugar and olive oil make a great scrub for all skin types. The fine texture of sugar helps remove the dead skin cells. Olive oil works as a great moisturizer for your skin. This scrub can be used to exfoliate all body parts, including the lips. Thoroughly mix a ½ cup of fine sugar and 2 to 3 tablespoons of extra-virgin olive oil. Add 2 to 3 teaspoons of honey and a little lemon juice to the mixture. Apply this mixture on your skin and rub it around using circular motions for a couple of minutes. Rinse it off with lukewarm water, and then gently pat your skin dry. Use this sugar scrub once or twice a week. If you drink green tea for health reasons, you can get double duty from it by recycling the used tea bags into a great homemade skin scrub. The slightly rough texture of green tea leaves can help exfoliate your skin to remove dead skin cells, dirt, and other impurities. Moreover, green tea enhances skin complexion, improves skin elasticity, and makes your skin healthy. Green tea also possesses anti-inflammatory and anticarcinogenic potential. Scoop out the contents of 1 or 2 used green tea bags into a bowl and add 2 to 3 teaspoons of honey. Optionally, add 1 tablespoon of baking soda. Mix the ingredients thoroughly to make a thick paste. Spread the mixture all over your face. Gently scrub off the mask using wet fingers. When you need a good exfoliator to buff off all those dead skin cells, your regular coffee grounds make a smart choice. 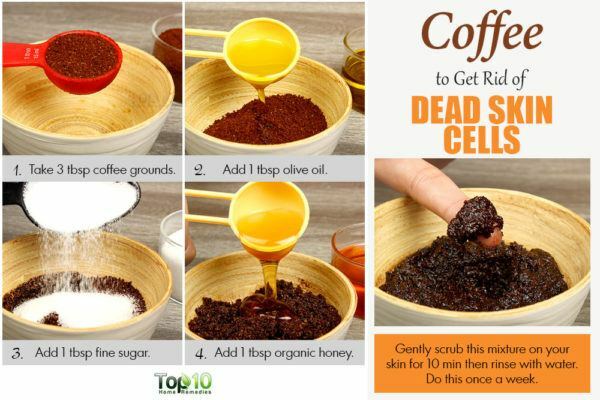 Coffee grounds help eliminate dead skin and support your body’s production of new skin cells. Moreover, the flavanols in the coffee grounds help improve skin texture, repair damaged skin, and maintain a glowing complexion. According to a 2013 study published in Analytical Methods, there are several substances in coffee that promote healthy skin. Mix together 3 tablespoons of coffee grounds, 1 tablespoon of either extra-virgin olive oil or almond oil, 1 tablespoon of organic honey, and 1 tablespoon of fine sugar. Massage the paste over your face, neck, knees, and elbows using gentle, circular motions. Then, let it sit on your skin for 5 to 10 minutes. Rinse it off with warm water and gently pat your skin dry. Almonds are a great way to pamper your skin. They are rich in antioxidant vitamins A and E. Also, almonds contain healthy fats that help maintain healthy and young-looking skin. It is the coarse nature of ground almonds that helps remove dead skin cells. Aside from the nut, almond oil is also beneficial for your skin. Almond oil has emollient and sclerosant properties that improve skin complexion and tone. Soak 10 almonds in water overnight. For better results, soak the almonds in milk. The next morning, peel off their skin and grind the almonds into a granular paste. Mix in 2 teaspoons of honey. Rub it in a circular motion for a couple of minutes, and then let it dry on your skin for 10 to 15 minutes. Use this almond and honey face scrub two or three times a week. After eating oranges, do not throw away the peels. Instead, dry the peels in the sunlight for a few days, and then grind them into a powder form that you can use in your skincare routine. The slightly abrasive nature of the powder works as a natural exfoliating agent. It can help remove dirt and dead skin cells from your skin. Plus, its rich antioxidant and vitamin C content helps rejuvenate your skin, making it appear young and vibrant. It is important to mention here that orange peel holds higher levels of vitamin C (ascorbic acid) than its juice. Mix equal amounts of orange peel powder and plain yogurt to form a smooth paste. With wet hands, gently rub off the paste using circular motions. Gram flour, also known as besan, is another effective natural ingredient that helps remove dead skin cells, making your skin glow. It also removes excess oil from your skin and prevents problems such as acne, pimples, and blackheads. A 2017 study published in the Open Dermatology Journal mentioned that gram flour acts as a tonic for the skin as it helps to clean and exfoliate it. Mix together 2 tablespoons of gram flour and a few tablespoons of rose water or just plain water to make a paste. Apply this paste on your skin and leave it on until it dries completely. Then, scrub it off with your wet fingers and rinse your face. 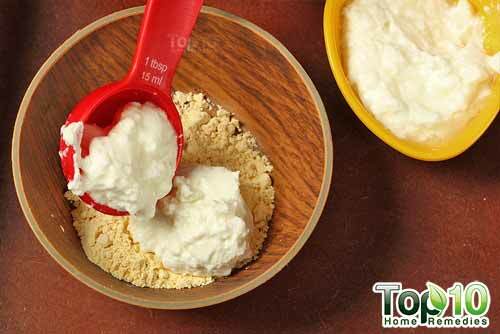 Another option is to mix 2 tablespoons each of gram flour and plain yogurt. You can also add 1 teaspoon of turmeric powder. If the paste is too thick, add a little more yogurt. Spread this paste on your face and neck. Allow it to dry completely, and then rinse it off. Fuller’s earth or any other clay-based masks help exfoliate your skin and get rid of dead skin cells. This clay is an excellent cleansing agent that can improve your skin complexion and even help remove suntan from the skin. According to a 2002 study published in Applied Clay Science, clay is rich in several minerals, vitamins, and other nutrients that promote healthy skin. Mix together 2 tablespoons of fuller’s earth and yogurt. Add 1 teaspoon of mint powder and blend the mixture well. Leave it on for 20 to 30 minutes, and then scrub off the paste using wet fingers. Finally, wash it off with warm water. Do this regularly, at least once a week. Yogurt is also beneficial in getting rid of dead skin cells. The lactic acid in yogurt works as an effective exfoliating agent that aids in sloughing off dead skin cells. Lactic acid can also lighten skin color. A 2011 study published in the Journal of Cosmetic Science reports that a yogurt pack using natural ingredients successfully improved the moisture, brightness, and elasticity of the treated skin. Blend equal amounts of yogurt and rose water. Mix in 1 teaspoon of vegetable glycerin and mix well. Apply the mask on your face. Finally, scrub off the mask. Then, rinse it off with cool water. To exfoliate your feet, especially the heels, a warm water soak followed by scrubbing the softened area with a pumice stone is the best option. This will get rid of the dead skin cells and also reduce the risk of cracked feet. This method is even effective in getting rid of corns and calluses from your feet. Pour warm water along with a few drops of mild liquid soap into a foot tub. Soak your feet in this warm soapy water for at least 15 minutes to soften the skin. Scrub the skin with a pumice stone using circular motions for about 10 minutes. Rinse off your feet with clean water and pat it dry with a soft towel. Apply olive or coconut oil generously on the feet. Wear a pair of clean cotton socks and leave them on overnight while you sleep. 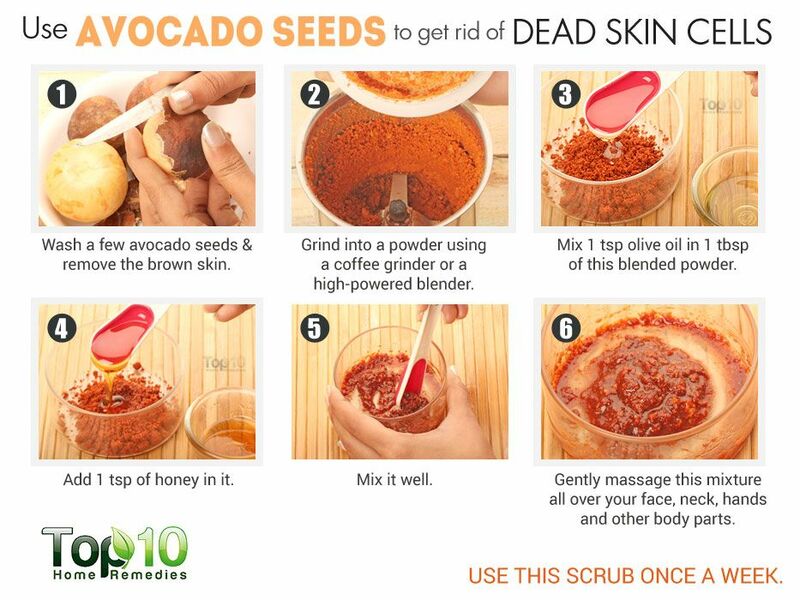 While it is very common to use the avocado pulp to make face masks, you can also use the seed to get rid of dead skin cells. It even helps remove excess sebum and other impurities from the skin. The seed is a rich source of antioxidants, which help repair and nourish dry and damaged skin. Wash a few avocado seeds and remove the brown skin. Grind them into a powder using a coffee grinder or a high-powered blender. Mix 1 tablespoon of this powder and 1 teaspoon each of olive oil and honey in a bowl. Gently rub this mixture all over your face, neck, hands, and other body parts using circular motions. Wait for 10 to 15 minutes, and then take a bath. Dry brushing also helps remove dead skin cells. It can effectively slough off the dead cells and open up your pores. It also tightens the skin and improves its texture. Stand upright in your bathroom. Using gentle but brisk motions, start dry brushing your feet and slowly move your way up, covering your legs, thighs, abdomen, chest, back, arms, and shoulders. Do this for 10 to 20 minutes. After you’re done dry brushing, enjoy a long warm bath. Finally, pat your skin dry and apply a moisturizer. Dry brushing can be done a few times a week. Note: Always use a natural bristle brush for dry brushing your skin. Before exfoliating your face, steam your face to open up the pores and soften up the oil, dirt, and dead skin cells from deep within the layers of the skin. Steam your face for at least 20 minutes before applying a scrub. You face should be clean and free of makeup before applying a scrub. As exfoliation removes the natural oil from your skin, making your skin dry, it’s important to apply a moisturizer right after. If any of the scrubs used on your face enters your eyes, rinse out your eyes immediately with cold water. Because mechanical exfoliation leads to the removal of a full layer of facial skin, it renders the newly exposed surface skin extra-sensitive to sunlight, making it more susceptible to sun damage. Thus, it is all the more essential to use sunscreen if you are using this exfoliating method. Remember to be gentle while scrubbing, as you do not want to be too harsh on your skin. Too much exfoliating or harsh scrubbing can result in redness and irritation. Do not use a loofah or sponge to scrub your skin. They are difficult to keep clean and tend to collect bacteria. How the skin grows. Employment and benefits | American Academy of Dermatology. https://www.aad.org/public/kids/skin/how-skin-grows. How to safely exfoliate at home. Employment and benefits | American Academy of Dermatology. https://www.aad.org/media/news-releases/how-to-safely-exfoilate-at-home. Nader Pazyar, Reza Yaghoobi, Afshin Kazerouni, Amir Feily. Oatmeal in dermatology: A brief review. Indian journal of dermatology, venereology, and leprology. http://www.ijdvl.com/article.asp?issn=0378-6323;year=2012;volume=78;issue=2;spage=142;epage=145;aulast=Pazyar. Published 2012. Safety and efficacy of personal care products containing colloidal oatmeal. Clinical, Cosmetic and Investigational Dermatology. https://www.ncbi.nlm.nih.gov/pmc/articles/PMC3508548/. Published 2012. Nilani Packianathan, Ruckmani Kandasamy. Skin Care with Herbal Exfoliant. Functional Plant Science and Biotechnology. https://www.researchgate.net/publication/224892687. Published 2011. Olive oil and skin. International Olive Council. http://www.internationaloliveoil.org/web/aa-ingles/oliveWorld/salud12.html. Katiyar SK. Green Tea and Skin. JAMA. https://jamanetwork.com/journals/jamadermatology/article-abstract/190508. Published August 1, 2000. Fruit peel nutrition facts and health benefits. Nutrition And You.com. https://www.nutrition-and-you.com/fruit-peel.html. Rashmi Saxena Pal, Yogendra Pal, Pranay Wal. In-House Preparation and Standardization of Herbal Face Pack. Open Dermatology Journal. https://pdfs.semanticscholar.org/1ca2/5c17343fd28d0dfa868e2abd0919f8e986dd.pdf. Published 2017. Thank you so much for those remedies, that is helping us for get better r skin, please tell me soming for face scar i have fair and healthy skin but, when i was teen age i got pimpiles and all that, i was touch pim and pop up, thats way i got scars on my both chiks, plese tell me the homeremide ti read off those scars. Yes but not very fast.. 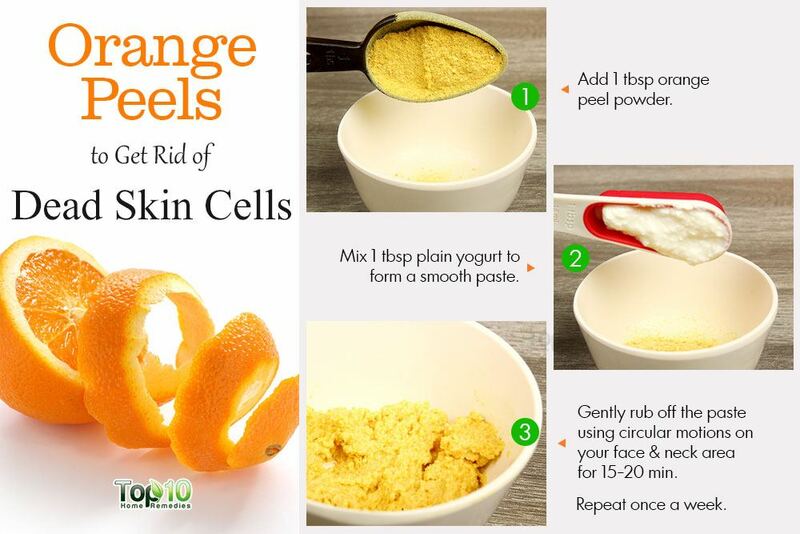 The use of orange peels as part of a facial skincare regime is an excellent idea. Thank you! Great hammer of Thor, that is poluwfelry helpful! Thanks so much for the info, please is the plain yogurt referred to in this article the same as the the yogurt we drink? I have oily skin and l am suffering from pimples on my chicks and on my forehead so help in getting out of this problem. Home and natural remedies would be better so kindly help me.